Capitalism Is Obsolete: What Is One To Make Of This Relationship? 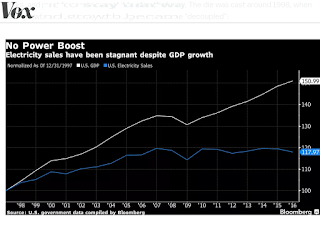 GDP has gone up, but power consumption is actually flattened out. What gives? First of all, certainly, is the fact that we make so little of what need, and consume, every day, here anymore; thinking somewhere in the echelons of power, that specialized services will keep us not only competitive, but fat and happy as well. So a lot of people do service work in a lot of sectors, and a few of us still make tangible things, and a specialized few make various forms of very technical things. And, as it actually happens, though we may well, in the majority be unhealthy weight wise, we are not actually all that happy in any of what we really need as humans; otherwise populism wouldn't have gone off its rocker there for a while; getting mesmerized by one fast talker, and facade fast change artist. Then there is the fact that, eight years after the start of the great recession, we are only now starting see real increases in real wages. 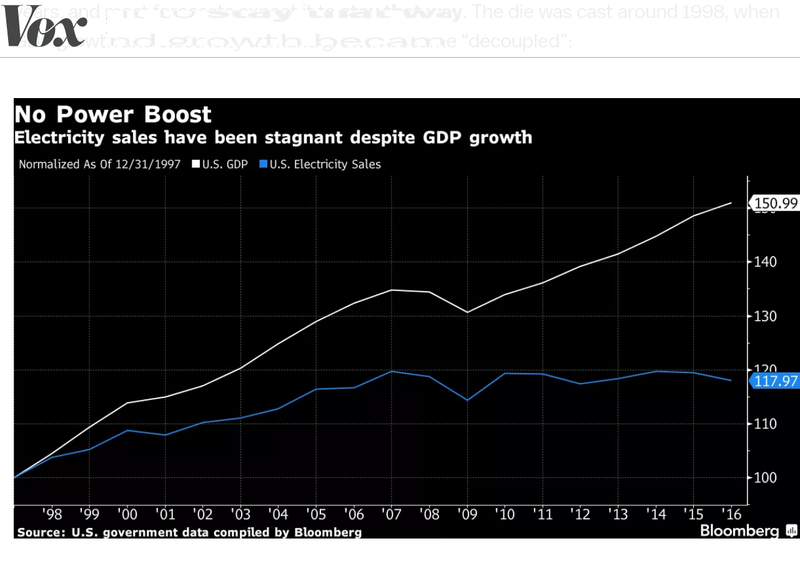 So there is probably another disconnect going on with the GDP, which is that, even though a lot of money is being made, by various, over large entities, the purchasing consumer still has limited purchasing power; and even there a great deal of it has been put into increasing debt. So right away you might have a good probability that fewer people can buy power consuming toys, or necessities. Then as well is the fact that we have made significant progress in making what does consume power consume less. And that is certainly a big plus. A hopeful plus as well as it also does go a long way to show that we can demand things when we work together to do so. If, of course, we can keep a focus on doing so, which isn't easy when so many are right at the edge of just getting by day to day; paycheck to paycheck. That this is also causing power utilities problems is also understandable; for both public and commercial power entities; something for which I have had a real taste of because I worked for nearly five years with Seattle City Light as, at first a hardware tech for desktops, and then later as a software developer. This is especially not a good time for this because utilities are also facing a good deal more existential challenge because of all of our newfound geophysical turbulence; whether from more extreme weather, or from the techtonics that have both wires, and pipes, stretching across physical fault lines, as well as social fault lines. It may well come to be that we can maintain roads and highways, or high tension transmission lines, but not both. Any more than we can allow for overly centralized power production now because that is simply not fault tolerant enough for the natation as a community of communities (having situations where one node in a system brings down an entire region, instead of a single community where a possible destructive event might have occurred. We want to be as efficient as we can be with energy because the effort it takes to bring it to us takes away from effort we might better need elsewhere. Having said that, however, doesn't preclude the need to also be ready to ramp up output of production very quickly when that becomes a necessity. So how is one to balance a bunch of new realities for how we do energy? And for this I will come back to what should now be a familiar theme: we must start by changing the dynamic that makes everything else already so difficult. And that is the dynamic that necessitates seeing everything in terms of what, and how markets put value into effect; as well to say that it has to be "cost" that is the other arbiter of what can, and can't be done; and that both of these then come to determine what "flexibility" will ever be able to be in the first place; which past history, in this absolutely necessary sector of endeavor, has shown to be very problematic at best.